The stars of tinsel town never miss a chance to look their best on, and off, the camera. Our recent obsession, however, is stalking what our favourite celebrity couples are wearing. Thankfully, Bollywood has enough star couples who make us drool every time they dress for an occasion. From Saif and Kareena to Deepika and Ranveer, here's a list of all the Bollywood couples who dressed to the nines this year. Check it out! We are smitten by what Saifeena wore to the Isha Ambani's wedding this month. Bebo's sequinned lehenga and Saif's bandhgala were deliciously colour-coordinated and, needless to say, the two of them were hot AF. There have been lots of times this year that the diva and her husband have given us breathtaking fashion moments, but this one remains our favourite. Sonam looks like the fashionista she is in this blue, checkered co-ordinated set and Anand looks every very suave in this teal green suit. And, love the fact that his love for sneakers is conspicuously visible as always. Deepika and Ranveer were caught twinning in Sabyasachi ensembles while heading to Bengaluru for their reception. While Deepika stunned in this off-white anarkali paired with beautiful chandbalis and her bridal chooras, Ranveer surprised us in a subtle, white kurta-pyjama set and floral Nehru jacket. So unlike Ranveer, isn't it? There are plenty of things we've learnt from this power couple and dressing for perfection is just one of them. The duo looked especially gorgeous in their minimal, monotone outfits for Diwali 2018 celebrations at home. Anushka paired her beige saree with a heavy diamond choker necklace while Virat donned an asymmetrical kurta-pyjama set from Antar-Agni. And, of course, how can we forget Shahid Kapoor and Mira Rajput? While attending an award show in 2018, the couple actually turned up in colour coordinated outfits. So cute. 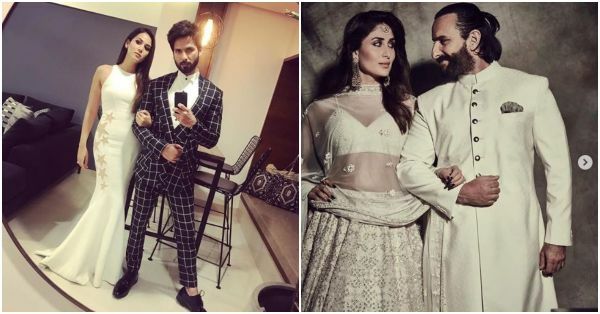 Mira in a white Monisha Jaising gown, and Shahid in a checkered suit by Gaurav Gupta that he paired with a crisp white shirt from Rohit Gandhi and Rahul Khanna. Could they look any better? So, who is your favourite celebrity couple among these? Tell us in the comments section.